Darran is the founder and director of EDM Studio. 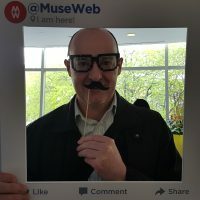 A scientist and visualization programmer by training, Darran has fifteen years of experience in digital exhibit design. Darran has managed the digital design and production of a number of large-scale projects such as the Museum of Australian Democracy core exhibitions and Calgary’s Science Centre, Telus Spark. Most recently Darran and the EDM team were involved with the reboot of the Canadian Science and Technology Museum where they created a number of visitor-facing digital experiences as well as the back-infrastructure that supports day-to-day operations. Darran's free time is largely spent playing, refereeing or coaching ice hockey.